This edition copyright © 1999 held by Whoosh! Meleager went off to get 'those new' javelins. Xena: Warrior Princess showcases a great variety of weapons from the past. Early military weapons were probably adaptations of hunting weapons, but as warfare became more sophisticated, weapons were adapted to support the doctrine and tactics of the armies that used them. As form follows function, the nature of warfare is reflected in its technology. Historically, classical Greece saw the development of hoplite warfare, built around heavily armored foot soldiers equipped with spears and shields. Such a form of warfare was possible only in a culture that waged war by certain rules and the hoplite went into decline when this ceased to be the case. Later, the Roman Empire was built by legionaries, armored swordsmen who combined mobility and discipline. Warfare in Xena: Warrior Princess is no less a function of its technology, which is adapted to, and therefore also promotes, the forms of combat that we see. Most combat in Xena: Warrior Princess occurs between individuals and small groups but we occasionally see armies engaged. Those in BEWARE GREEKS BEARING GIFTS (12/112), GIANT KILLER (27/203), and THE PRICE (44/220) are fairly small, deploying only a few hundred men at the most. Similarly, in ONE AGAINST AN ARMY (59/313), the number of campfires only indicates a force of about 300 men, less than half of a Roman cavalry regiment, and therefore only represents the vanguard of a much larger force. The forces engaged in IS THERE A DOCTOR IN THE HOUSE (24/124) are probably considerably larger, judging by the presence of artillery, but we do not actually see them. The first time that we actually see a full-sized army deploying is in THE DELIVERER (50/304), when Caesar deploys several legions to fight Boadacea. If Caesar is deploying all his available legions, as he says, this force could be 30,000 or more. It appears that Xena does have experience leading armies of this size, for in the Hercules episode, JUDGEMENT DAY (H52/315), Ares notes that in the Battle of Corinth, Xena's army slew some 10,000 men, which would indicate that Xena commanded an army at least two or three times as large. Most recently, in A GOOD DAY (73/405), a figure of 15 legions is reported. This would be about 90,000 men, and therefore seems to represent the combined strength of both Caesar's and Pompey's armies, which historians put at 35,000 and 55,000 respectively. Xena herself carries a number of weapons. Her primary weapon is a sword. This double-edged weapon resembles a Roman cavalry sword ("spatha"). It was similar to, but longer than, their infantry sword. The long sword permits both mounted and dismounted action. Xena normally carries her sword on her back. This is done because carrying it to one side, either on her belt or in a scabbard directly attached to Argo's saddlery, would unbalance Argo's load. To balance the load would require a counterweight on the other side, such as a shield or a carry bag as in THE DEBT (52,53/306,307). In this, Xena resembles the horsemen of the Australian Light Horse who carried their rifles on their backs. Her secondary weapon is the chakram, a missile weapon of Indian origin. In a pinch, she sometimes uses it as a blade, as in ONE AGAINST AN ARMY (59/313) where she slashes a Persian's throat with it. Xena frequently carries a throwing knife in her boot. She also carries the small breast dagger that Gabrielle purchased in DREAMWORKER (03/103) (as if, Gabrielle notes, Xena's breasts aren't already dangerous enough). 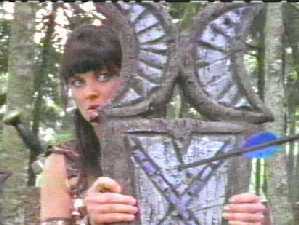 Xena uses it in DREAMWORKER and on Kraftstar in THE DELIVERER (50/304). Finally, she has a stockwhip that can be used as a weapon, albeit fairly ineffective one. Xena's leather armor affords good protection with a minimum of weight and a maximum of mobility. The arms and legs are completely free. The bronze at the front is decorative, but the perforated design also gives protection with low weight. Xena's equipment demonstrates her philosophy of the offensive. By contrast, the more heavily armored Joxer's assemblage seems to broadcast a desire not to get hurt. His armor looks somewhat oriental, as does the practical helmet in which he sometimes, quite correctly, wears some greenery as camouflage. But it must get pretty hot in that gear in the Greek summer sun. Joxer carries a short sword. Like his armor, this would be ideal in a compact group, but it is unsuited to the more freewheeling and open formations that occur in Xena: Warrior Princess . Then of course, there is Argo! Argo does not wear an ancient Greek or Roman style saddle but one of more recent North American design. The prominent horn at the front is intended for a lariat. Because Australian stockmen do not use lariats, this feature is normally missing from Australian saddles. As a matter of fact, Xena does use her whip on occasion as a lariat, most notoriously on Gabrielle in THE BITTER SUITE (58/312). Actual Roman saddles had four horns, one in each corner. Like all the horses in the series, Argo wears shoes rather than Roman sandals. However shoes were known to have been in use amongst the Celts, and we know from THE DELIVERER (50/304) that Xena has had contact with the Celtic people. Similarly, Argo has stirrups, a device of eastern origin not used by the Greeks and Romans. Again, we know from THE DEBT (52,53/306,307) that Xena has had contact with the people of the Asian steppe and could have acquired the technology. Unfortunately, as attractive as this theory may be, it has a serious flaw in that everyone else seems to know about it as well! Everyone seems to have modern bitting and stirrups, and Xena never has any problems obtaining horseshoes, as demonstrated in BEEN THERE, DONE THAT (48/302). Xena leads mounted troops in THE DEBT (52,53/306,307) and TIES THAT BIND (20/120). That cavalry does not appear more often is no doubt related to the greater cost of maintaining horses, a cost that bears on both armies and production companies. Originally, horses were too small to be ridden, so the chariot was invented. They were normally drawn by pairs of horses, but additional horses could be added if extra speed was required. As horses were bred larger, the chariot became obsolete as a weapon of war but remained in use for ceremonial and sporting purposes. Chariots first appear in CHARIOTS OF WAR (02/102), where Xena and Gabrielle engage in a chariot race. In RETURN OF CALLISTO (29/205), Xena pursues Callisto in a chariot, and in THE DELIVERER (50/304), the Warrior Queen Boadicea makes her appearance in a chariot. Perhaps no technology differs so much from historical reality as swords. In classical Greece, the Greek soldier (hoplite) was armed with the spear as a primary weapon, and the sword was purely secondary. Indeed there was no classical Greek word for a swordsman, and they used the expression "by the spear" where we might say "by the sword". The classical Greek sword is not in evidence anywhere. The closest we come to the hoplite are the Israelites in GIANT KILLER (27/203). Although not occupying their historical pride of place, spears are frequently employed. The army of the warlords in THE GREATER GOOD (21/121) and TIES THAT BIND (20/120); the Israelites and Philistines in GIANT KILLER (27/203); the palace guards in WARRIOR...PRINCESS (15/115) and WARRIOR...PRINCESS...TRAMP (30/206); and the Romans in DESTINY (36/212), DELIVERER (50/304), WHEN IN ROME... (62/316), and A GOOD DAY (73/405) all carry spears. Xena takes the Arthurian challenge. By contrast, swords appear in almost every episode, including what must undoubtedly be the most famous sword of all time, Excalibur, which appears in GABRIELLE'S HOPE (51/305). 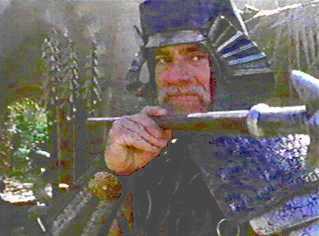 Swords are usually of the longer double-edged broadsword variety like Xena's, suitable for use by or against cavalry. The disadvantage of this weapon is that it requires more room to swing. One notable exception is Joxer, who carries a short thrusting sword. Homer reports that the Trojans used battle-axes, but none are to be seen in BEWARE GREEKS BEARING GIFTS (12/112). Battle-axes of a type with a blade on one side and two spikes on the other are employed by the warlord in CHARIOTS OF WAR (02/102) and, quite successfully, by two of the warlords in TEN LITTLE WARLORDS (32/208). In THE PRICE (44/220), the Horde made good use of small axes with a curved grip that made them easy to use as missile weapons. Monlik, the thief, later uses one of their axes in THE DIRTY HALF DOZEN (49/303) and one can be seen on the wall of Ares' temple, along with edged weapons from several other episodes, in SACRIFICE II (68/322). A different kind of small throwing axe is also used in TIES THAT BIND (20/120). A heavy double-headed axe with two curved blades seems to be the weapon of choice of hooded executioners in the Xenaverse. We see it used again and again, in episodes such as THE BLACK WOLF (11/111), GIANT KILLER (27/203), THE EXECUTION (41/217), and THE DIRTY HALF DOZEN (49/303). I am unsure as to why an executioner's axe requires two blades, but they are normally weighted towards the head for extra momentum. In GIANT KILLER , Gabrielle grabs the executioner's axe, to help free her latest boyfriend and is lucky not to lose more than her blood innocence in the ensuing fight. As by the Roman soldiers in real life, the dagger is employed as a secondary weapon, most notably by Xena and Callisto, who also use their daggers as missile weapons. The other use of the dagger is in religious rituals, as in ALTARED STATES (19/119) and THE DELIVERER (50/304). Concussion weapons are less often employed, reflecting the emphasis in Xena: Warrior Princess on a quick kill. Gabrielle, of course, carries a staff, employing techniques taught to her by the Amazons in HOOVES AND HARLOTS (10/110) and presumably, subsequently by Xena, who demonstrates her own proficiency with the weapon in SINS OF THE PAST (01/101). In TEN LITTLE WARLORDS (32/208), Ares for some reason chooses to employ a mace consisting of a spiked metal sphere connected to a chain and a handle. A small mace is used as a missile weapon in ORPHAN OF WAR (25/201). The principal missile weapon of the ancient world was the bow, and bows are prominent on Xena: Warrior Princess , in episodes such as THE GREATER GOOD (21/121), THE BLACK WOLF (11/111), ORPHAN OF WAR (25/201), and A GOOD DAY (73/405). 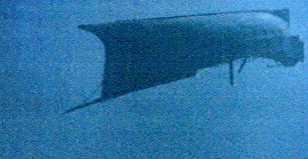 Ulysses employs his famous bow in his eponymous episode, sending a shaft straight through three men. In THE PRICE (44/220), the Greek garrison sternly reports that it is running short of arrows and may have to make some unpleasant decisions. In BEEN THERE, DONE THAT (48/302), Xena, Gabrielle and Joxer are apparently killed by arrows. Xena, of course, can catch arrows in the air. In DEATH MASK (23/123), Gabrielle stops an arrow with her staff. She "catches an arrow" in a different sense (in her shoulder) in ONE AGAINST AN ARMY (59/313) and narrowly avoids this fate in HOOVES AND HARLOTS (10/110), while Xena caught one (in the abdomen) in CHARIOTS OF WAR (02/102). Crossbows appeared by Roman times. They were more difficult to construct than bows and did not yield significantly superior performance. Nonetheless, the weapon had its uses, especially in small sizes for hunting birds and large sizes used as field artillery. In THE GREATER GOOD (21/121), Callisto uses an excellent example of such a small crossbow to attack Xena with a poisoned dart. In CALLISTO (22/122), Joxer carries a similar small crossbow which, alas, is swiftly destroyed by the faster Gabrielle's trusty wooden staff. One is also used in HERE SHE COMES...MISS AMPHIPOLIS (35/211) as part of a trap. Full sized crossbows also appear sometimes. In BEWARE GREEKS BEARING GIFTS (12/112), Perdicus uses one to good effect against the Greek army besieging Troy, and the archers in TIES THAT BIND (20/120) use them. As the average Roman soldier did not carry a bow until the late Imperial period, the principal missile weapon of the Roman soldier in Julius Caesar's time was the javelin. In THE DELIVERER (50/304), Caesar himself hurls a javelin at Xena, but she intercepts it with her trusty chakram. In A GOOD DAY (73/405), Gabrielle hurls a javelin at a Roman soldier, but she misses. Darnelle, as he points out for both our benefit and Glaphyra's, carries a javelin in THE DIRTY HALF DOZEN (49/303). This gives him a weapon that can be used like a spear, doubling as a missile weapon. In the same episode, Glaphyra uses throwing knives, while the warlord Agathon creates his own boomerang-like weapon, with unfortunate results. In GIANT KILLER (27/203), David dispatches Goliath with the aid of a sling. I am surprised that this weapon is not seen more often, for it takes up little room, stones are plentiful, and, in the open formation warfare practiced in Xena , there is plenty of room to deploy it. Another weapon was the blowgun, a long tube used for firing darts. One of the bad guys tries to use one on Xena in TIES THAT BIND (20/120) but, hilariously, she appears suddenly and unexpectedly, and blows the dart down his throat. This ship goes to the bottom in TSUNAMI. Ships appear in many episodes, including THE ROYAL COUPLE OF THIEVES (17/117), DESTINY (36/212), TEN LITTLE WARLORDS (32/208), ULYSSES (43/219), LOST MARINER (45/221), THE DELIVERER (50/304), and WHEN IN ROME... (62/316). These are usually large sailing vessels, of surprisingly uniform design. Such vessels would be well suited to ocean travel and it seems that there are trade routes operating as far as China ( THE DEBT [52-53/306-307]) and South America ( THE BLACK WOLF [11/111]). Gabrielle and Joxer sail a small South Pacific style outrigger in TEN LITTLE WARLORDS , and Xena and Gabrielle have a canoe in THE PRICE (44/220) and GABRIELLE'S HOPE (51/305). None of the ships are military vessels, although a Roman one is glimpsed in THE DELIVERER (50/304). However, in HERE SHE COMES...MISS AMPHIPOLIS (35/211), Xena and Gabrielle note the wreck of a warship, and Xena recounts the story of a naval battle "so bloody that the sand was soaked red", not an improbable occurrence in a battle employing edged weapons. On occasion chemical weapons are used. There is, of course, Xena's fire breathing trick. In THE PRICE (44/220), Xena has the besieged Athenian garrison construct a number of smoke bombs. The recipe for this is, alas, not given out, but the ancients knew of bitumen, naphtha, petroleum, and sulfur and used them to construct such devices. Greek fire makes a town strategically valuable in IN SICKNESS AND IN HELL (72/404). Xena also uses a smoke screen to aid her escape in BEWARE GREEKS BEARING GIFTS (12/112). Flaming arrows are used in the siege of Troy in the same episode. Flaming arrows were used to set siege machines and works on fire, although here Perdicus employs one like an normal arrow, in the anti-personnel role. Incendaries are extensively used by the catapults in A GOOD DAY (73/405). Shields are surprisingly uncommon and most soldiers in Xena do not carry them. The simple round type is seen from time to time but only plays a significant part in GIANT KILLER (27/203), where highly polished bronze shields are used to dazzle the giant Goliath. Roman soldiers in DESTINY (36/212), THE DELIVERER (50/304), and WHEN IN ROME... (62/316) carry the Roman shield (or "scutum") with historically accurate designs on them. I am less certain about their leather armor. All of my sources depict Roman soldiers of this period in chain mail. Metal armor is apparently uncommon in the world of Xena: Warrior Princess . Plate armor is employed in THE DIRTY HALF DOZEN (49/303). In particular, chain mail is rare, although it is worn by one of the warlords in TEN LITTLE WARLORDS (32/208). THE DIRTY HALF DOZEN (49/303) is unique in that it is an episode built around a military technology, namely the metal of Hephaestus. This metal could be a magical one, but it could also be carbon steel, which the ancients did not have the high temperature furnaces to smelt. (Some scholars believe that Excalibur was made from meteoritic steel.) It appears that Xena's chakram is also made from the metal of Hephaestus, as it was not dented by Agathon's weapon. In any case, it seems likely that no one will be repeating Ares' experiment in the use of armor for a while. 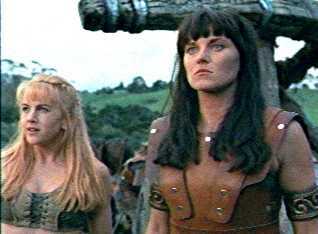 Gabrielle and Xena stand in front of captured catapults in A GOOD DAY . Given the abundance of fortifications in Xena: Warrior Princess , albeit somewhat poorly and cheaply constructed compared with their historical counterparts, we should not be surprised to find siege equipment. Catapults or ballistas are never seen, but their effect is felt in IS THERE A DOCTOR IN THE HOUSE (24/124). Siege ladders are used in CALLISTO (22/122), although not in the intended manner. Although most historians believe that the Trojan wooden horse was a siege engine, it is not the case in BEWARE GREEKS BEARING GIFTS (12/112). The episode does show a small battering ram the size of a telephone pole in use, however. Catapults play a significant part in A GOOD DAY (73/405), where two are actually seen in action and they not only play a significant part in the battle, but are themselves fought over. In Xena: Warrior Princess , a wide variety of military technology is available. Combat tends to be in the open, and between individuals or small groups in loose formation or no formation at all. Such circumstances favor lightly armored troops equipped with swords and occasionally with missile weapons, which is precisely the situation that we observe. Thus, the series remains true to the principle of the congruence of military technology and tactics. Ross Mallett hails from Melbourne, Australia. He has a Bachelor of Science degree from the University of Melbourne and a Master of Business Administration from Monash University. He has recently completed a Master of Arts thesis at the Australian Defense Force Academy in Canberra on Military Technology and the Australian Army in World War One. He is a long time fan of Blake's 7 as well as Xena and has written a number of fan fiction stories for both fandoms.